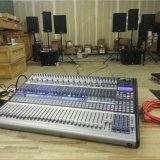 I just bought an AR8 studio live mixer. Im happy with it but i have a big problem with the sd card recording. The is a ton of hiss when i play it back after recording. I tried to record it with the max of gain in my input and master but there is still a lot of hiss. So actually this feature is unusable. And i basically buyed this mixer beacause of this feature. I readed on the forums that many users have this problem. The problem is hardware or software? Maybe a software upgrade or do i have to bring it back to the store????? This is a community driven system, if you need assistance from PreSonus please. File a support request at http://support.presonus.com so the support team can assist you directly. StudioLive AR16 board - SD card confusion!? ?